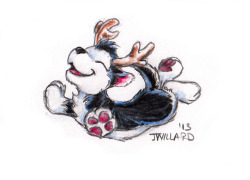 Welcome to Soap Puppy Productions, home of J Willard, her furry art, Falstaff, and the gestalt hive-mind of Billie D. Huskie. You want art? We got art! Click HERE to see the art! Like any of this stuff? Take it home and display it in the location of your choice via the online store! Original art is available now! With support from a number of extremely patient people, I am attempting to LiveStream — tentative schedule right now is Saturday evenings from 6-ish to 8-ish pm, Eastern time. Stop in for scribbling, off-key singing, and imaginary huskies!